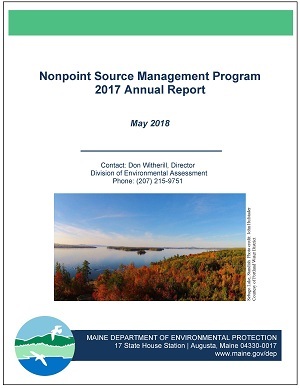 DEP provides services to control nonpoint source water (NPS) pollution to help protect or improve Maine's lakes, streams, rivers, and coastal waters. This report summarizes accomplishments of NPS Program activities in 2017. This work is funded, in part, under Sections 319 and 604(b) of the Federal Clean Water Act (CWA) in partnership with the U.S. Environmental Protection Agency. Ten NPS watershed projects funded in previous years were completed reducing pollutant loads to waters by 153 tons/year of sediment, 268 pounds/year of phosphorus, and 168 pounds/year of nitrogen. The report includes an outcome summary for each project. DEP issued 13 new grants ($945,564) using CWA Section 319 funds to help communities implement actions called for in their watershed management plans to restore impaired waters or protect waters threatened by NPS pollution. DEP also issued three grants using CWA Section 604(b) funds to develop watershed-based plans.